This graphic of the Mountain Rescue building site shows the safe zones around the proposed training tower. The Pitkin County commissioners on Wednesday unanimously approved on first reading a new 13,900-square-foot building for Mountain Rescue Aspen (MRA), complete with a 45-foot tall training tower, just upvalley from the Aspen Airport Business Center. The proposed project will come back to the commissioners on March 27 for a second reading of a resolution, but it appears any points of contention have been worked out by the board. 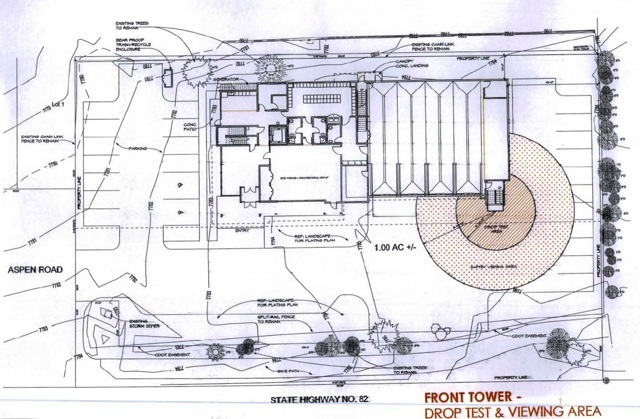 The commissioners first reviewed the building on Feb. 13 and expressed concerns about the height of both the building and the training tower and asked MRA’s architect, Charles Cunniffe of Aspen, to tweak a few elements and explore some options to reduce the visual impact of the building from Highway 82. 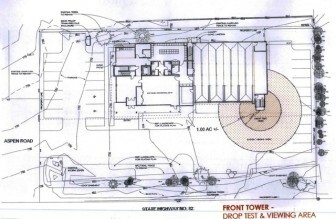 On Wednesday, however, the board endorsed the volunteer rescue organization’s original proposal with just a few minor changes, such as the angle of the roof on top of the training tower, which will be close to the edge of the highway in the location of the former Planted Earth garden center building. And while Commissioner George Newman voted in favor of the project, he also said the building will still be eye-catching. Newman said it could be like the new hospital building in Aspen — while people value the services the hospital provides — they still think it looks too big. The 45-foot-tall tower on the corner of the MRA building will be used to train volunteers in rescue techniques that require ropes and awareness of sheer drops, as well as for testing gear before using it in the field. Speaking in support of the tower, Cavanaugh O’Leary, a MRA volunteer and its attorney, told the commissioners that training was serious business for the organization. Over 20 members of MRA’s 50-member team crowded into the small commissioners’ meeting room Wednesday, wearing red MRA T-shirts and jackets in a show of support for the new building. A number of volunteers told the commissioners that being able to train nearly year-round in a controlled environment instead of only in the field would be a real plus for the organization. “It would be really nice to have a closed setting that we know is safe — we know the anchors are completely safe,” said Keith Bosscher, the operations director for MRA, especially when it comes to training for “high-angle” rescues on cliff faces. In addition to the training tower, the proposed building includes a 65-person meeting room, lockers for volunteers and their gear, bunk rooms for post-rescue rest, and 6,000 feet of garage space for MRA’s mix of trucks, trailers, ATVs and snowmobiles. The building, which will include an emergency power source, also is expected to double as a back-up command center for local law enforcement officials. Commissioner Michael Owsley said the building would be a positive statement of the community’s caring values, which MRA epitomizes. “I’m glad that it is in the location that it is,” Owsley said, noting that it might be one of the first buildings that visitors who land at the airport and travel into Aspen see. MRA leaders said in February that they hope to construct the building and training tower this year. The Mountain Rescue Aspen Charitable Trust — funded by a grateful beneficiary of the organization’s rescue efforts in the ’70s — bought the building site for $1.6 million to allow the organization to move out of its cramped cabin on Main Street.